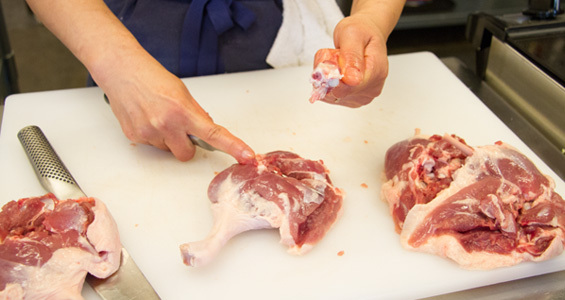 Turn the duck leg over (skin side down). 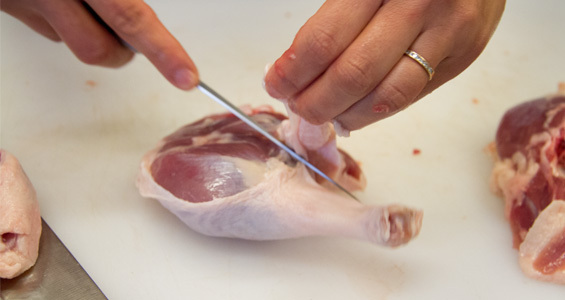 Pull the excess skin and fat away from the edge of the leg and cut it off. Follow the line of the thigh bone with your boning knife, cutting through the flesh to expose the bone. 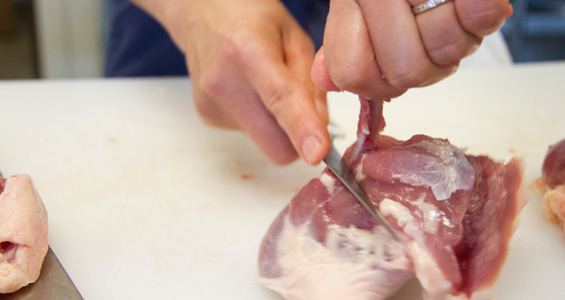 Slip the knife under the bone, near the knuckle at the body-side of the bone, and cut outwards to free the knuckle. With the blade of your knife under the bone, scrape down from this cut towards the thigh-leg junction while pulling the bone up. This should free the bone up to the joint. Twist the thigh bone to pop the leg-thigh joint open. Cut into the joint and through the gap with your knife to free & remove the bone.